Clean up your credentials to get hired as a housekeeper. 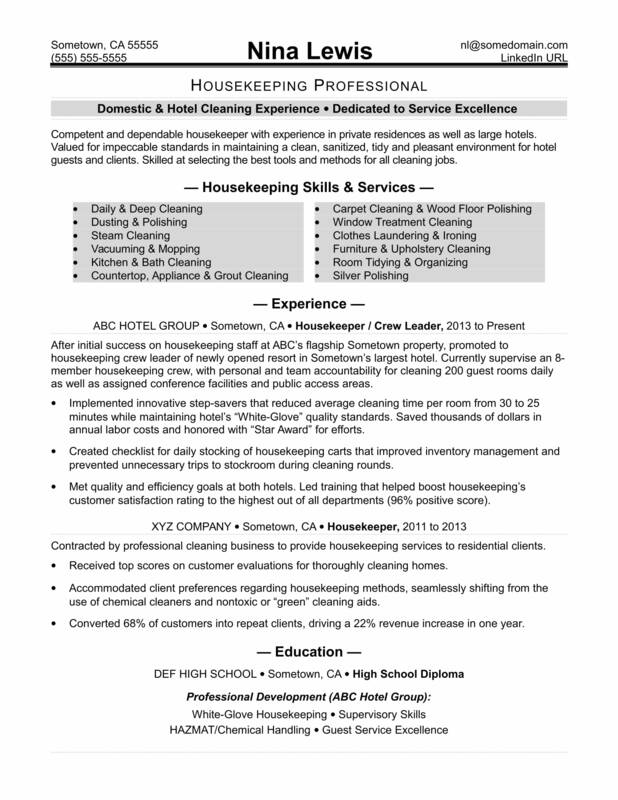 If you’re looking for a housekeeping job, you’ll need a resume that sparkles. Like a perfectly tidy room, your resume should be fresh, clean and orderly, says resume expert Kim Isaacs. And just as guests are expecting a welcoming room free of dust and debris, so are hiring managers expecting a resume free of errors. For writing tips, view the sample resume for a housekeeper that Isaacs created below, or download the housekeeper resume template in Word. According to the Bureau of Labor Statistics (BLS). You'll find the highest level of employment for this job in the following states: California, Florida, Texas, New York, and Pennsylvania; and in the following metropolitan areas: New York City, Las Vegas, Los Angeles, Chicago, and Houston. As a housekeeper, you can expect to earn a median wage of $22,860 per year, or $10.99 per hour, according to the BLS. Additionally, you can learn about hospitality careers and search for housekeeping jobs on Monster. Competent and dependable housekeeper with experience in private residences as well as large hotels. Valued for impeccable standards in maintaining a clean, sanitized, tidy and pleasant environment for hotel guests and clients. Skilled at selecting the best tools and methods for all cleaning jobs. After initial success on housekeeping staff at ABC’s flagship Sometown property, promoted to housekeeping crew leader of newly opened resort in Sometown’s largest hotel. Currently supervise an 8-member housekeeping crew, with personal and team accountability for cleaning 200 guest rooms daily as well as assigned conference facilities and public access areas. Implemented innovative step-savers that reduced average cleaning time per room from 30 to 25 minutes while maintaining hotel’s “White-Glove” quality standards. Saved thousands of dollars in annual labor costs and honored with “Star Award” for efforts. Created checklist for daily stocking of housekeeping carts that improved inventory management and prevented unnecessary trips to stockroom during cleaning rounds. Met quality and efficiency goals at both hotels. Led training that helped boost housekeeping’s customer satisfaction rating to the highest out of all departments (96% positive score). Contracted by professional cleaning business to provide housekeeping services to residential clients. Received top scores on customer evaluations for thoroughly cleaning homes. Accommodated client preferences regarding housekeeping methods, seamlessly shifting from the use of chemical cleaners and nontoxic or “green” cleaning aids. Converted 68% of customers into repeat clients, driving a 22% revenue increase in one year. One way you can convince a hiring manager that you're the right housekeeper for the job is by making your resume as clean and professional as possible. Could you use some help? Get a free resume evaluation today from the experts at Monster's Resume Writing Service. You'll get detailed feedback in two business days, including a review of your resume's appearance and content, and a prediction of a recruiter's first impression. You're an expert at keeping things tidy; let the experts at Monster give your job search the white glove treatment.